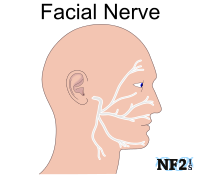 About Us Donate News What Is NF2? Carole Mitchell: Our last and final speakers will be -- last and final speakers plural will be Dr. Dr. Matthias Karajannis, Director of the NF clinical research program here at NYU, and Amanda Merkelson at the children's center at NYU. Thank you very much. (Applause). Dr. Matthias Karajannis, NYU: Thank you Carol. Thanks everybody for coming today on this Saturday. Just as a way of introduction, I'm a pediatric neurooncologist so I'm treating children with brain tumors. 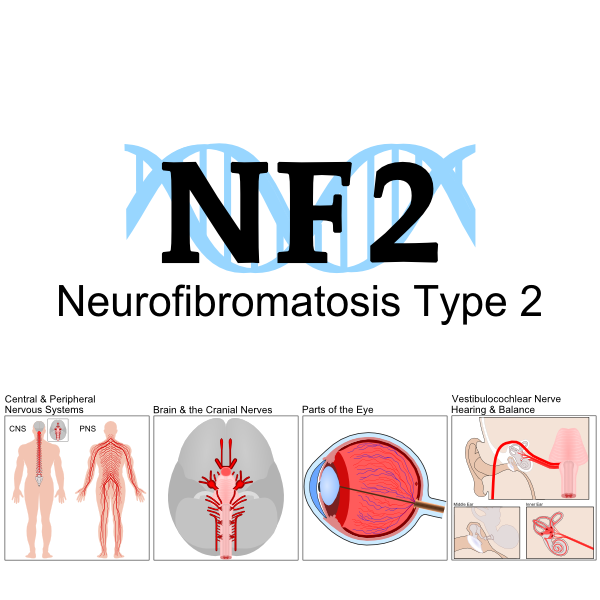 I also have a special interest in NF2. 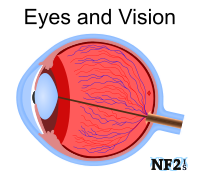 I see and treat both children and adults with NF2. Just as a general introduction, what really are the goals of NF2 medical therapies? We heard a lot about surgical therapy. So I'm going to focus now on some of the medical therapies, some options available now, and some options that may be available in the future. I think it's fair to say that the goals of treating NF2 with medical therapy is of course to avoid surgery, but really to shrink existing tumors, to stop existing tumors from growing, to prevent the development of new tumors perhaps, and very importantly improve symptoms, either hearing balance, strength, or other neurological impairments that are caused by the tumors. What types of anti-tumor drugs exist? When we talk about drugs that treat tumors, we often think about traditional chemotherapy. Those are the kinds of agents that we use to treat predominantly malignant tumors. These are drugs that kill or damage tumor cells, but they also almost invariably have an effect on normal cells as well. And it's often what limits their use. They often work best against highly malignant rapidly growing tumors and that's not usually the situation in NF2. These often have major side effects such as hair loss, anemia, low blood counts, increased risk of infections. There's concern for many of these drugs for secondary tumors that are arising a few years after treatment with this type of chemotherapy. It's a specific concern also for NF2 as we've heard in relation to radiation therapy. But some of it applies perhaps to chemotherapy although we don't know that for sure. There's a new sort of crop of drugs that have been used increasingly for treating tumors in the last ten years. These are called molecular target agents or smart molecules, designer drugs, there are several descriptions that have been used for these kinds of molecules. These are drugs that aim to exploit tumor specific vulnerabilities. Rather than killing all cells, finding a vulnerability in a specific tumor, and trying to exploit that. These are typically less toxic to normal cells compared to chemotherapy. And have fewer side effects in many instances. For most of these agents there's a reduced or no risk for secondary tumors, or there's also a decreased risk in most of these drugs for permanent problems, meaning you stop the drug and the body recovers. When we designed clinical trials for NF2, specifically but for other tumors in general, we usually use what's called end points. An end point is something that is measurable in a clinical trial, and measuring that selected end point is the goal of the trial. Examples for end points that we have been using or might use in NF2 clinical trials would be one percentage shrinkage on MRI, to test the medicine, or improvement in hearing. In some clinical trials one is a primary end point and the other is secondary. How the population you're trying to treat looks like or what the goals of that specific treatment are. A drug that a lot of you have heard over the past years is called Bevacizumab or the trade name is Avastin. 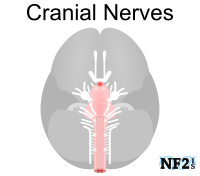 The reason is this was the first drug that has been convincingly shown in NF2 to be able to shrink tumors, specifically vestibular schwannomas. But not only that, but also to improve hearing. There was an important paper that came out several years ago that reported -- actually it was one of several papers that came out just around that time from a number of groups. This was the largest collection of patients. These were ten patients total that were treated with that medicine. Not on a clinical trial, but this medicine was used out of desperation because at that time there were no clinical trials open and no drugs were specifically developed for NF2. Essentially out of desperation, patients who had little or no hearing left, and with NF2 were treated with this medicine, fortunately it worked in several of these patients that were treated. In this particular case series, six out of ten patients had some tumor shrinkage as evidenced on MRI, and four out of seven patients had hearing improvement. There's more clinical trials currently ongoing with this medication, and NYU will be opening a trial probably in a few months for children as well as young adults with NF2. Avastin is already licensed to treat various cancers but not NF2 at the present time. It's called a monoclonal antibody that's a protein that inhibits molecules called VEGF. That VEGF molecule is involved in blocking blood vessels inside of tumors. And when you block that process, you can shrink tumors. This is a cartoon that shows how VEGF is floating around the tumor, secreted by the tumor. Then the Avastin comes and mops up that vegf molecule, and then the blood supply to the tumor is decreased and the tumor shrinks. The medicine is given intravenously every two to three weeks because it has a very long half life, meaning it stays around in the body a long time. That's why Dr. Golfinos mentioned earlier when you do surgery after getting this drug you have to wait several weeks to get it out of your system as it will otherwise impair with wound healing and increase the risk of bleeding. Side effects with this medication include high blood pressure, kidney damage or protein in the urine that usually doesn't become an issue until you've used the drug several years. Impaired wound healing, increased risk of bleeding and blood clots. Bowel perforation is quite rare. And ovarian failure meaning that female patients often will have irregular menses, or will stop having menses. Sometimes they have not returned after stopping the drug. This is a concern that has come up now that more patients are treated with this medication. We're very careful that we point that out to any of our patients that we treat with this medication, the risks involved with this medication. However, the vast majority of patients will tolerate this medication with very little or no side effects, even when it's given over prolonged periods of time. But the longer you give it, the higher the risk. The advantages. It improves hearing dramatically in some patients, not all patients, with NF2. It's usually well tolerated, especially in the short term. The disadvantages are about half of NF2 patients do not respond, or perhaps even slightly less than half. Meaning the tumors don't shrink or the hearing doesn't improve. The patients that do improve require continued treatment. When you stop the drug, the hearing gets worse again and the tumor starts to grow back. So it's like a permanent treatment once you're on it. It's not effective for meningiomas. And they're a major problem for many NF2 patients. For some of the NF2 patients, meningiomas are a bigger problem than vestibular schwannomas. And Avastin unfortunately does not work with these tumors. Side effects become an issue long term. And it's very costly, perhaps about $40,000 a year for treatment. I mentioned the drug is licensed for other cancers, but not NF2. So for each individual patient if it's given outside of a clinical trial it has to be negotiated with the insurance company. More recently we have been able to get insurance companies to pay for many of the NF2 patients as more and more NF2 patients are treated with this medication. In some patients we can also get some assistance from the drug company or the manufacturer or a combination of both. But the reality seems to be now that for most patients that come to us that are good candidates for this medication, we can get it. Another medication that we have investigated in clinical trials is called Lapatinib, or Tykerb. It's available orally. It's already FDA approved for breast cancer, well tolerated with minor side effects. We measured volumetrics on our clinical trials. This is a computer picture to show you how we measure it and we can very accurately measure responses to drugs. We just published this prospectus in the clinical trial very recently in a medical journal. These are the summary of the results. Each bar represents a vestibular schwannoma tumor in a NF2 patient. And when the bar goes down, that means that the tumor shrank, and when the bar goes up, that means the tumor grew. In the majority of the cases that means there was some shrinkage in the vestibular schwannoma. All these tumors shrank more than that and met what we had to defined as the end point for this clinical trials. Bottom line is it seemed to help some patients and seemed to slow down vestibular schwannoma growth in other patients. But the effect appeared not to be as powerful as the effect with Avastin. Although we don't know if the patients that respond to Avastin would also respond to Lapatinib or vice versa. We don't know if these are the same patients that would respond. We had tumor shrinkage in about 24 percent of patients. We had some hearing improvement in close to a third of patients. However usually the hearing improvement was minor, not as pronounced as we see sometimes in patients treated with Bevacizumab. And also hearing improvement was not permanent. It only lasted a short period of time. However we do have some patients that improved for a longer time. Also we didn't see improvement in meningiomas. We thought this drug was well tolerated in NF2 patients. Long term use is feasible. Some had tumors shrink, some had tumors stop growing. However the hearing improvement was predominantly limited and transient. We're currently conducting a similar clinical trial using another oral drug that's approved for other cancers called RAD 001, or Everolimus. This study is ongoing but we're not recruiting new patients until we see responses. Also briefly another type of trial that we're running that will be called phase 0 trials. These are trials where a patient takes a drug for ten days prior to a surgery. These are patients that are scheduled to -- or that require surgery for vestibular schwannoma that agree to take the drug for a short period of time prior to the surgery. And we then take some of the tissue that's taken out at surgery and look at it in the laboratory to investigate how well medications get into the tumor, and how well perhaps they could treat the tumor. We also try to learn how to improve delivery of drugs, or improve drugs to better affect the vestibular schwannomas. 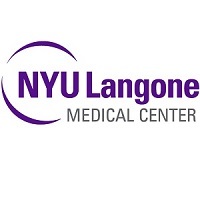 We currently have a Lapatinib phase 0 trial ongoing here at NYU, and a number of collaborating institutions, New York Presbyterian, Johns Hopkins, Ohio State, and we're actively on this trial. As I said this patient is for patients who require vestibular schwannoma surgery and would be willing to take a short course of an oral drug prior to the surgery and help us learn how we can improve treatment with this type of medicine. We have some very interesting results from the first batch of tumors that we had the chance to look at. But we will need a few more patients to enroll in the study to generate some final data on this trial. We're also working, or actually about to open a RAD 001 phase 0 clinical trial that will also open at a number of institutions including NYU. Perhaps as evidence that it's been recognized that this type of work is important, we received a very generous grant from the national cancer institute for this study, highlighting that this type of work is recognized as important to better develop new drugs for NF2. I want to acknowledge everybody that participated in this work. Everybody at our NF center, and also our collaborators at other institutions. Most importantly I would like to thank you, our patients, for coming here today for giving us the privilege to take care of you, and to participate also in our clinical trials. When you participate in a clinical trial, you will take on inconveniences. You will take on extra steps that are needed to get on these clinical trials. But you help us learn more about treating this disease. I think this is the way that we can provide for some help in the future to find better treatments. Thank you very much for your attention. I welcome any questions now or later. Amanda Merkelson will come after me and speak a little bit more about the technicalities of how these trials are run, and what it means to you. from a patient perspective to participate in some of these clinical trials. (Applause). Carole Mitchell: Presenting Amanda Merkelson. Amanda Merkelson: Good afternoon, everyone. I'm the manager of the center's clinical trials office. I'm here today to tell you about research studies specifically about clinical trials as a type of research study, what they are, how they are designed, what you can expect if you decide to participate, the obligations you'll take on, and your doctors will take on as they treat you in this clinical trial. In the interest of time, I put up this slide about the different kinds of research studies. These are just a few of many different types of designs. I won't go into detail about these because I do want to focus on clinical trials which are specific types of research studies that involve human subjects. Clinical trials are research studies that involve people. These studies test new ways to prevent, find, diagnose or treat diseases. Someone comes up with a hypothesis, which is a scientific question, and writes a plan on how to answer that question. Even though we all think of clinical trials as highly scientific, and very technologically advanced, the truth is clinical trials have been around since the beginning of time. Somewhere between 605 and 562 BC, King Nebukanezer is reported to have carried out the first clinical trial when he ordered that a strict diet of meat and wine be followed for three years. Four children of royal blood convinced the king to allow them to exchange bread and water for the required time. After only ten days, those who had switched to bread and water appeared more resplendent and well nourished than those who stuck to wine and meat. In 1537 a renaissance surgeon mixed oil and rose, turpentine and egg yolk as a replacement for the common treatment of open wounds. One day after the unintentional study, the surgeon observed the wounds treated with the traditional formula were swollen and extremely painful, while the wounds treated with the experimental mixture were not at all painful. My purpose in telling you these stories is to say that while clinical trials have certainly come a long way, their importance and vital role in the play of the future of medicine is still very significant. New study medications or study devices are often studied in different phases of the clinical research process. Phase one clinical trials are conducted mainly to evaluate the safety of agents or other types of interventions such as new radiation therapy techniques or even new ideology techniques. Phase one trials help to find out the highest dose of a study drug that can be given safely, and whether the study intervention causes harmful side effects. Phase one trials enroll small numbers of people who have advanced notice, and although looking at the effectiveness of these interventions is not precisely the goal of these types of phase one trials, the doctors do look to see if these interventions might be useful as treatments. Phase two clinical trials test to see how effective the intervention can be in people who have the specific type of disease. They also continue to look at the safety of the intervention. Phase two trials usually enroll fewer than 100 people but may also include as many as 300. People who participate in phase two clinical trials may or may not have been previously treated with the standard therapy for their type of disease. Phase three trials compare the effectiveness of the new intervention or the new use of existing intervention with the usual treatment for a disease, also called standard of care. Phase three trials also examine how the side effects of the new intervention compare with those of the usual treatment. If the new intervention is more effective, then the usual treatment and/or is easier to handle, it may become the new and usual treatment. It may involve large groups of people like 100 to several thousand who are randomly assigned to two treatment groups or trial arms. A control group in which everyone in the group receives the usual type of treatment for the disease. Or an investigational group in which everyone receives the new intervention, or the new use of an existing intervention. The trial participants are randomly assigned to one of these two groups by a process called randomization. Randomization helps ensure that groups have similar characteristics. The balance is necessary so the researchers can have confidence that any differences they observe between the two groups are due to the treatments themselves, and not to other underlying differences between the two groups. Randomization is usually done by a computer program to ensure the human choices do not influence the assignment of the groups. And as trial participants you cannot choose what group you get into. And the researchers cannot influence how you're assigned to the group usually. And this depends on the study. Neither you as participants or the investigators know what group you've been assigned to. People who participate in phase three trials, like I said, may or may not have been treated previously. If they had been treated previously, their eligibility to participate in a specific trial may depend on the type of the amount of prior treatment they received. And in most cases, an intervention will move into the phase three testing only after it has shown promise in phase one and phase two testing. Every clinical trial has a protocol or an action plan that describes what will be done in the trial, how the trial will be conducted, and why each part of the trial is necessary. The protocol also includes guidelines for who can and cannot participate in the trial. These strict guidelines called eligibility criteria describe the characteristics that all interested people must have, whether they can control that or not, before being able to participate in the trial. Eligibility criteria can include age, gender, previous medical history, and current health status. Like we talked about earlier about randomization including people in two different groups to ensure similar characteristics, enrolling people who have similar characteristics ensures that the outcome of the trial is due to the intervention rather than underlying factors that make people different from one another. In this way, eligibility criteria help researchers obtain the most accurate and meaningful results. Because these criteria are so strict, even if you have one characteristics that excludes you or prevents you from being in the trial as written in the research protocol, you may not be able to participate in that particular trial. Each clinical trial is managed by a group of doctors, nurses, research assistants, data analysts, and other specialists. The research team works closely with other health professionals such as doctors, nurses, laboratory technicians and pharmacists to provide medical and supportive care to you, to the people who participate in clinical trials. The research team closely monitors the health and safety of people taking part in the trial, and gives them specific instructions when necessary. To make sure the research team can depend on the results coming from the clinical trial and not from outside factors, it is important for you as the participant to follow the team's instructions very, very carefully. These instructions may include writing down when exactly you take your study medication, keeping a record of the side effects you feel, or answering questionnaires. You will also be given a schedule of study visits that you should follow very carefully. Trial participants may be required, as Dr. Karajannis said, to make more visits to the doctor than they would if they were not in the clinical trial and/or you may need to travel farther for these visits. Just as it is critical that you as the participant follow the instructions, it's also just as important that your research team, the physicians and nurses caring for you, follow their own instructions as written in the protocol, and that they give you your exams and tests and procedures exactly as it is dictated in the research protocol. You may also be asked to keep a long term record of how you are feeling after your participation in the research study so the research team can get updates on your health. If the research team has a clinical trial you think you might be interested in based on your disease, your ability to follow instructions, your treatment history and other characteristics, they may want to discuss getting your consent or agreement to participate in the study. This is the first step of the informed consent process. Informed consent is a process through which people learn the important facts about a clinical trial to help them decide whether or not to take part in it, to continue to learn new information about the trial that helps them decide whether or not to continue taking part in it. It's basically a living process, not a one time conversation. During the first part of the informed consent process you will be given detailed information about the trial, including information about the purpose of the trial, the tests, the other procedures that will be required, the possible benefits and harms of taking part in the trial, confidentiality, compensation if you get injured, and especially the costs involved in participating in the trial. In addition to talking with the doctor or nurse, you as a potential participant will be given an actual document with all of this information in writing. And you will be given plenty of time to think about whether or not you want to participate. You may take the form home with you, discuss it with family and friends, ask as many questions as you want. We have no time limit necessarily. If you agree to take part in the study you will be asked to sign this informed consent form with the physician who may or may not be your regularly treating physician. However, signing the form -- this is very important for you to know -- signing the form does not mean that you must remain on the trial the entire time. Anyone can choose to leave a clinical trial at any time, either before it starts or at any time during the follow up period. You don't have to give a reason for stopping the clinical trial but the research team will of course ensure that you stop your participation safely. The research team can also stop your participation without your permission at any time if they feel it's in your best medical interest or for any other reason. The informed consent process like I said is not a one time conversation. It continues throughout the life span of the trial, or accurately throughout your involvement in the trial. If new benefits, risks, side effects are discovered during the course of the trial, new procedures are added, the researchers will inform you so you can decide whether or not you want to continue to take part in the trial. One thing that's important to talk about, not everyone's favorite topic but it's a very important aspect of participating in a clinical trial is cost. The cost of care of participating in a clinical trial really can be divided into two categories. Routine care costs and research costs. Routine care costs are those associated with treating a person's disease, whether or not they're in a trial. These costs are usually covered by health insurance. But requirements vary by state, and type of health plan. Research costs are associated with those costs -- sorry. Research costs are costs associated with conducting a clinical trial. These costs may include the costs of extra doctor visits, extra tests, extra procedures that are required for the trial but you may not have had as part of your regular routine care. Research costs are usually covered by the organization that sponsors the trial, meaning the organization that provides the money to conduct the research. But this may not always be the case. So it's very important to investigate how the costs of care will be covered before joining the clinical trial. Anyone thinking about participating in a clinical trial should first discuss the cost coverage issues with representatives of your health plan. In the interest of time, one other type of study that I would like to mention because it's very important to Dr. Karajannis and Dr. Allen, and therefore it's very important to me, is tissue and tumor banking studies. These are studies where your participation may not go further than offering your consent or agreement to having a sample of your tumor banked for future research when there's a specific research question in mind. You may or may not directly benefit from taking part in a clinical trial. Especially tumor banking. The clinical trial could include procedures and medications that you would not receive if you were not participating in it. But you should know that the information that is collected from you, from your participation, could help other investigators and scientists in the future, and help with other patients with disease in the future. (Applause). Carole Mitchell: Thank you, Amanda. Clinical trials can be so confusing for a lot of people. There are so many different phases and so much criteria. They're just so rigidly controlled and we wanted to be able to present something so it's a little more understandable to you. Does anyone have any questions of our speakers? FROM THE AUDIENCE: if a person does not live near a center that is running a clinical trial, would they ever be accepted into it? Dr. Matthias Karajannis: I'm happy to answer that. The general answer I guess would be yes, but there are some caveats. Number one, the travel of course. The patient would have to be able or afford to travel to the required trial visits. That would be number one requirement. Some of these clinical trials, particularly in the first few weeks of treatments, have perhaps weekly study visits. So that can be a difficulty. It's usually not from our end that we tell patients you can't be on it because you live a certain distance. But usually it's the patient who realizes that they're just not able to participate, and fulfill the requirements, for example, in the doctor visits. Sometimes patients ask us if you need to check me every week, can't that be done by my primary doctor? Or perhaps if you need to give me medication every month, can't you just send it to me? Or if you need to check my blood once every four weeks, can that be done by my regular doctor in California? The answer is usually no. The reason is that when we conduct a clinical trial we have to comply with a lot of regulations, and some of them include that the assessments, the study assessments have to be done by us because we're responsible not only for doing them in the right way and in a consistent way, but also in recording the information so that the information is reliable, and that the information can also be reviewed when we, for example, are audited by let's say the drug company or the federal sponsor and so on. So we can't rely on outside physicians who may or may not be experienced in clinical trials to record or obtain that information. And even relatively simple things like laboratories for many clinical trials it can't just be any laboratory. It has to be a laboratory that is licensed to give these kinds of results. So there's many circumstances that can limit the participation of patients who are out-of-state. And not to forget sometimes certain health plans don't apply outside of your home state. These are usually sort of the factors that will determine whether it's possible to enroll somebody out-of-state. We've done it. We certainly welcome the interest. We don't exclude somebody per se because they live a certain number of miles away but these are some of the issues we have to deal with and together with the patient have to try to find a solution. But sometimes it's not possible to find. FROM THE AUDIENCE: This is not a question about clinical trials or actually treatment or hearing. 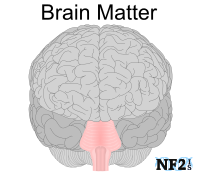 It's really a question about the NF2. These tumors, or not even the meningiomas but the other tumors that can occur, can they affect other mental functioning? Like either personality, or other kinds of disorders, mental disorders, psychotic disorder, is there the possibility of those types of symptoms as a result of NF2? Dr. Matthias Karajannis: The answer is certainly yes. When we just look at the MRI scans of some of our NF2 patients that are heavily affected by tumors that have a large tumor burden in the brain, there's very few areas of the brain that are not affected. Many patients have multiple very large meningiomas that compress certain areas of the brain. When we do MRI's we see swelling of the brain in certain areas. Some patients can get symptoms like seizures. Certainly depending on the tumors, can certainly develop other symptoms as well. Sometimes it's not easy to pin it down to a specific tumor for us. If we have a vestibular schwannoma and we find hearing loss, it's easy to make that connection. If a patient is having personality changes perhaps there is a meningioma that compresses or causes swelling in the frontal lobe. These are things that we can sort of piece together but it can get very difficult, particularly for patients who may have tens or hundreds of tumors in different areas of the brain, and it can be very difficult to tease out what is causing one thing or another. And often it's a combination of tumors, of symptoms, and let's not forget the social circumstances and so on. Because mental health is affected by many factors, just as general health. And often it's not just one thing or one tumor that causes the problem. FROM THE AUDIENCE: Next steps if you wanted to have an individual conversation about the up coming trial. Dr. Matthias Karajannis: A very good resource is a website called clinicaltrials.gov. Clinicaltrials.gov. That is a site from the federal government that lists all ongoing clinical trials. Whenever you run a clinical trial, these days you're pretty much obligated to register it with that site. That means if you have a certain disease, you can go to that website, type in your disease, and you can customize your search about things like age, or whether it's a treatment study, or an observation study, whether it's open or whether it's closed, things like that. And you can look, for example, for Neurofibromatosis by typing that in as a key word, or NF2. Clinical trials will come up and there's usually a page that describes what the eligibility criteria are, whether the trial is open, what the goals of the trial is. Sometimes there's even some more information about how many visits, for example, are necessary and so on. It will always list a contact, who you can E-mail or call to find out more about that specific clinical trial. All clinical trials that are done in general with very few exceptions now are listed on this site. They have to be listed by the time they open it. At the latest. Very often they list it before they open. Certainly we are happy to see any patients not just for consultation in general, but also if there are questions about clinical trials, myself or my colleagues are always happy to answer E-mails. Or if you want to come in in person for a consultation. We'd be happy to spend time to tell you about what's open at that time, not just at our institution but also at other institutions, and what might perhaps be open three or six months down the road. We're very connected with the NF2 research community in this country, but also across the pond if you will. Since we go to meetings several times a year and talk to all of our peers, usually we have a pretty good sense of what's coming down the line. Almost always know about clinical trials before they actually open. We're a good resource to let you know if we think there's something significant coming down the road in the next few months, for example, or for that specific tumor that you have and we'll be happy to answer those questions. FROM THE AUDIENCE: Earlier it was mentioned that there was lab research in regards to tumor banks and studying tissue. Is there anything related to cord blood? I happened to store my daughter's cord blood and I am paying yearly because I just feel scientifically there has to be some -- I'm storing this thinking maybe there will be some way it could be used. Is there any studies or research being done into that that would help? Dr. Matthias Karajannis: The main current use of cord blood is for some malignant cancers, particularly things like leukemia, to use that as a way to replenish your bone marrow after a specific type of high dose chemotherapy treatment. That is something that does not apply to NF2 patients. There are some other efforts to look at the cells in cord blood which are immature of blood cells to try to perhaps use them for sort of genetically engineered types of clinical trials. They've been used for some patients to sort of correct some errors of metabolism, for example and those kinds of things. At the present time, I don't see a specific indication, and to my knowledge there's no research that is at a stage right now where I could see an application of these cells in the near future or the medium term future. Maybe some time in the future. But I don't see a ready application for these types of cells. I think that there's more higher likelihood that you would see maybe some kind of vaccine or immune therapies develop in the future. I would welcome that very much. But the use of cord blood cells I don't see as helpful at least in the near future. FROM THE AUDIENCE: This goes to your up coming trials, trials which are planned. Can you give some context to the trials which have not given positive results or existing or previous? Dr. Matthias Karajannis: That's a very good question. Because when we treat patients with other brain tumors, we use surgery, radiation. Often we use chemotherapy or other treatments. The reality is -- why your question is so excellent -- that very few if any other chemotherapy or other anti-tumor drugs have been tried in NF2. One of the reasons is that many of the drugs that we use for malignant brain tumors, doctors have been too afraid to give them to NF2 patients because they often cause what we think are perhaps too severe side effects. Really there exists almost no data on the use of the usual types of chemotherapies that we would use for patients with brain tumors for NF2 patients. Perhaps that is something that we need to revisit. There are medications now that are chemotherapy but they're very well tolerated. We use them to treat other low grade or slow growing brain tumors including young children with relatively few side effects. Perhaps it would be a good idea to revisit or try to look into some of these medications for NF2 patients. But I can just tell you that historically there's just not been much interest from physicians to use these drugs for some valid concerns, but maybe some other concerns are maybe not as big of an obstacle. But I personally think we should investigate some of these drugs. A lot of these drugs are old drugs. They're not necessarily expensive. They may not be a drug company that may be interested in developing this kind of drug because the license is long over. But this may be an advantage. We're actually looking into perhaps using some of these medications. We have to be very careful a lot of them have neurological side effects. That's something that we definitely want to avoid for NF2 patients because neurotoxic drugs, for example, are drugs that cause hearing loss. Yes. FROM THE AUDIENCE: What makes these -- once you remove the tumor, why does it grow back in the same place? And the medicines that you do give us does not really help because the tumors still grow? Dr. Matthias Karajannis: NF2 is what we call a systemic disease. It's very different from a patient with a tumor that develops one tumor and you take it out, and it's the end of the story. NF2 patients keep developing new tumors. 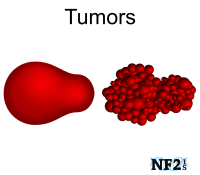 When a tumor in a NF2 patient is taken out completely, it very rarely grows back. It can but it's pretty rare. The much more common scenario is that a tumor develops right next to it, or a small tumor that was already right there right next to it will grow. That's why it's so important that I think that ultimately if we want to successfully develop treatments for NF2, these should be treatments that prevent new tumors from forming. If we find those kinds of treatments, and treat patients early enough, one day I think we will really make a difference for NF2 patients by preventing the tumor growth in the first place because what we're doing right now, because of where we are scientifically and medically, is really we're trying to contain the damage that's already done. But we're not -- we don't have the capability yet to really attack the problem at its root. And that is what the community really wants to do hopefully some time in the future, hopefully still in my lifetime, to develop these treatments that really get at the root of the problem. But we're not there yet at the moment. FROM THE AUDIENCE: Is that what you mean by genetic? Would that be genetic treatment? Dr. Matthias Karajannis: Right. Correct. 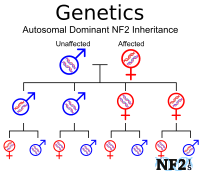 An NF2 patient has lost one copy of the NF2 gene in every cell of the body. And then when a cell loses the second copy by accident, then a tumor forms. So if we had a medicine that would prevent losing that second copy in our body's cell, that would probably solve the problem. Those types of medications do not yet exist. But I'm hopeful that one day they will. FROM THE AUDIENCE: You had mentioned possibly an upcoming Avastin clinical trial. Will that just be given to somebody who has a rapidly growing tumor or would it be considered for somebody that has a small stable vestibular schwannoma to hopefully prevent it from ever growing? Dr. Matthias Karajannis: The trial was revised a few times. It's run through the department of defense consortium. It's not just written by one individual. But it's written and revised, and has to be approved by a large body of investigators. So there have been several changes to the design of this trial. I haven't seen the final version of the trial yet. But as I recall, because the trial -- the primary end point is hearing improvement, if you still have normal hearing you wouldn't be eligible for that one. But again, the final protocol has not been released. And it will still take probably at least six months until that trial will start. But I believe the way it's written at the moment you have to have some hearing impairment to be eligible. It's not eligible for -- hearing impairment in one ear I believe is sufficient. FROM THE AUDIENCE: I have not seen your clinical trials. And a new drugs that are coming up, in 2002 at the Cleveland clinic they studied the effects of -- -- they noticed that it was quite potent. So to people who get a clinical trials, I really recommend they try things like that. Or more recently, the other drug for schwannoma -- have you heard of them at all? Dr. Matthias Karajannis: Patients asked me about other types of medicines. FROM THE AUDIENCE: Could you repeat the two medicines or things that he talked about please? Dr. Matthias Karajannis: One of the medicines is a - Ryvoxin. FROM THE AUDIENCE: More recently Dr. Lee in South Korea. Honokiol inhibits schwannomas. FROM THE AUDIENCE: Vyloxin, I think they say the use at molecular levels, at low levels, that you need a lot for meningioma cells. Dr. Matthias Karajannis: Most of the drugs we use for example, they work in the 1/1,000 of the concentration that you would see in the micro molar range. It really depends on the medications a lot. You really have to look at each individual medication. But all I can say is that a medicine has an effect on tumor cells in the Petrie dish in the laboratory. Many times it does not translate into a viable therapy in a human being. There's a lot of things that look great when you use them in the laboratory, but there's many caveats in trying to translate that into the human. That's what we're trying to do. I'm very open minded about using things that make biological sense, that have a rationale to use them. I think we all agree that if we find a drug that is effective, we don't really care where it's coming from or how it looks like as long as it's well tolerated and treats the tumors. But we've been treating tumors for a long time for other cancers. And many of the things that we used have been disappointing that looked great in the lab. FROM THE AUDIENCE: Two years ago I was taking the medicine, and right here I have MRI that shows after two years everything is still the same. So it gave me some kind of hope that the medicine is working. Although I am not taking it anymore because it was a clinical trial study. It kind of did something for me because there's no more growth or any sign of new tumors. And the pain that I have is not related to NF. Carole Mitchell: Very good news. (Applause). FROM THE AUDIENCE: Actually with Avastin, I know in some cases tumors are growing back after it stopped. FROM THE AUDIENCE: I know it hasn't had the same effect in shrinking the tumors but what about stability after? Dr. Matthias Karajannis: We've had a good number of patients on that particular study that showed no growth during the year treating them or some other patients were treated longer, up to two years. When we look at these results we have to be very careful how we interpret them because as Dr. Golfinos presented earlier, the growth pattern of vestibular schwannomas and meningiomas can be very sort of erratic. They don't grow in a line like this. Usually they grow like this and then they can plateau and then they grow and can plateau. They sometimes can stay stable for a year or several years before they start growing again. So when we have a patient on a clinical trial and a tumor stays stable over a year's period, that is not proof that the medicine is doing it. We hope the medicine is doing this but we can't use the data as proof. If we enroll 20 patients on that particular study and none grew during the year, that would be pretty good evidence but still no proof. However, the way we design our clinical trials is to design for shrinkage because we know the tumors never shrink by themselves. So if we see a tumor shrinking, we can be quite confident that this is due to the medicine, and not just due to chance. So this is why we design those trials that way, because we think -- because this is the only reliable way you can figure out whether medication works in a relatively small number of patients. If we had a drug that stops the growth of tumors, that would be great too. If it's a drug that's tolerated well. But to prove that that drug is effective you would have to run a probably phase three large trial where you randomize several hundred people with NF2 either getting the drug or not getting the drug, and then looking for differences in growth. That's how large of a study you'd have to run to prove beyond a doubt that a medicine that just stops tumors from growing is effective in a clinical trial. Cannot be done in a small study. Carole Mitchell: One last question because we need to wrap up. FROM THE AUDIENCE: How far after participant in a clinical trial is taking the medication do you follow them so that you can determine if perhaps there's rebound stimulation of the tumor growth? Dr. Matthias Karajannis: I'm not sure how we would pick up -- in terms of you mean accelerating tumor growth? FROM THE AUDIENCE: Yes. Rebound. 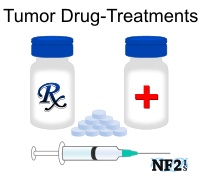 Dr. Matthias Karajannis: We certainly see with drugs that we use for NF2 an effect where you see a benefit in the first three months or six months, perhaps the tumors get smaller and the hearing gets worse. And then some time down the road the tumors start to grow again. That happens with patients on Avastin. We've certainly seen that with patients treated with Lapatinib, a hearing response or the tumors went away or shrank and started growing back. It certainly happens. When this happens, we usually don't know exactly the mechanism. We would like to know the mechanism. But we don't at the present time. It's one of the reasons why we're doing our phase 0 trials, to figure out why what some of the resistance mechanisms might be. But it's a very different situation compared to malignant tumors that often develop new mutations that become more aggressive the more you treat them. NF2 is a bit different. And we still have to understand better how these medications work. Carole Mitchell: Thank you all very much. (Applause). I just want to remind you again to please fill out the evaluation form. This was our first meeting, the first time we've ever gotten together in New York City. We really would love to have your feedback that we plan for better meeting next year. Thank you again for coming. Use your blue sheet to get a boxed lunch. Safe going home, watch out for the storm. Be prepared and be safe with the weather that's coming in the next few days. Thank you.